One of my goals before I leave New Zealand is to see their iconic bird, the KIWI! This shy bird is nocturnal, hides in the forest and comes out to feed at night, and being endangered, there are many sanctuaries found throughout New Zealand to protect them. I was thrilled to think we had found a KIWI! We stopped along the roadside to look at the view and this cute little bird came out of the bushes and stayed with us for about 5 minutes - we were so excited other cars stopped and started taking pictures. A day later after looking up what species this KIWI was, we were so disappointed to find it wasn't a KIWI but a Weka. A flightless bird like the KIWI but probably related to the Chicken! Drat! 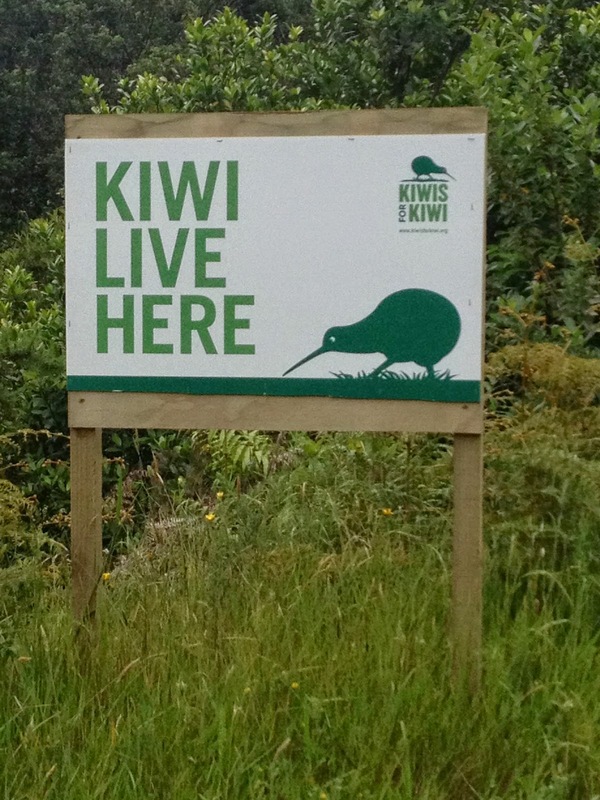 New Zealanders that I have talked to say even they have never seen a KIWI - "The only way you are going to see a KIWI is at a zoo". They also wanted to remind me that there is more to a KIWI than a KIWI. What?? "We locals proudly call ourselves KIWIS and there is a fruit we are known for that is called a KIWI - You will find plenty of KIWIS in New Zealand, so open up your mind and quit searching for something you may never find"
KIWI Kate (our AirBnB landlord in Aukland) pictured in the middle invited us to her 60th birthday party. 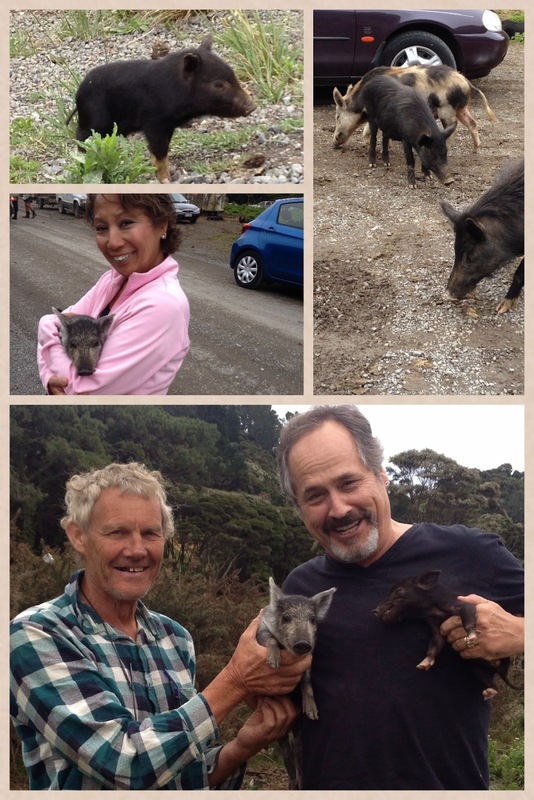 Mixing with the locals is so much more fun than searching for an elusive KIWI!! 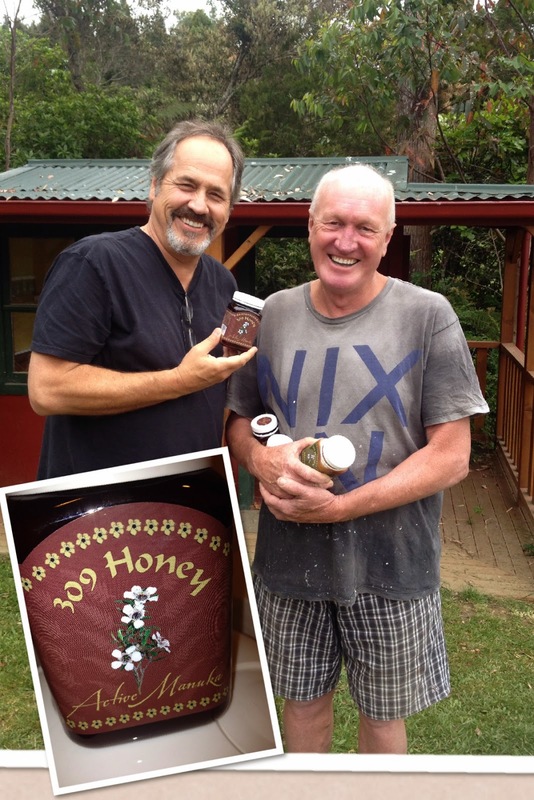 ...Andy, another KIWI, produces the famous Manuka Honey New Zealand is known for. Manuka Honey is used for natural woundcare, digestion, skincare, and more! My honey was confiscated by the airline TSA (oops, I thought I packed it). The KIWI TSA allowed us to stand there and eat as much as we could - this miraculous honey filled me so I wasn't hungry for my airline meals! This KIWI is a farmer in the hills of the Coromandel Peninsula that has never worn a pair of shoes in his life. We happened to be taking a drive when all 60 of his pet pigs decided to cross the road. Of course we had to pull over and chat with him about his pigs. He was so friendly and talkative we ended up staying for an hour. 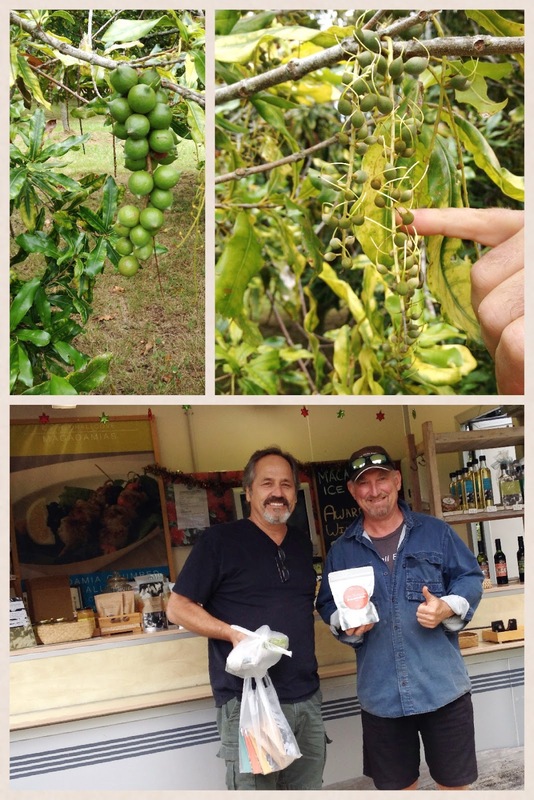 Fred a Kiwi by marriage, was generous in giving us a tour of the Macadamia Farm he works on and hoping to own someday. 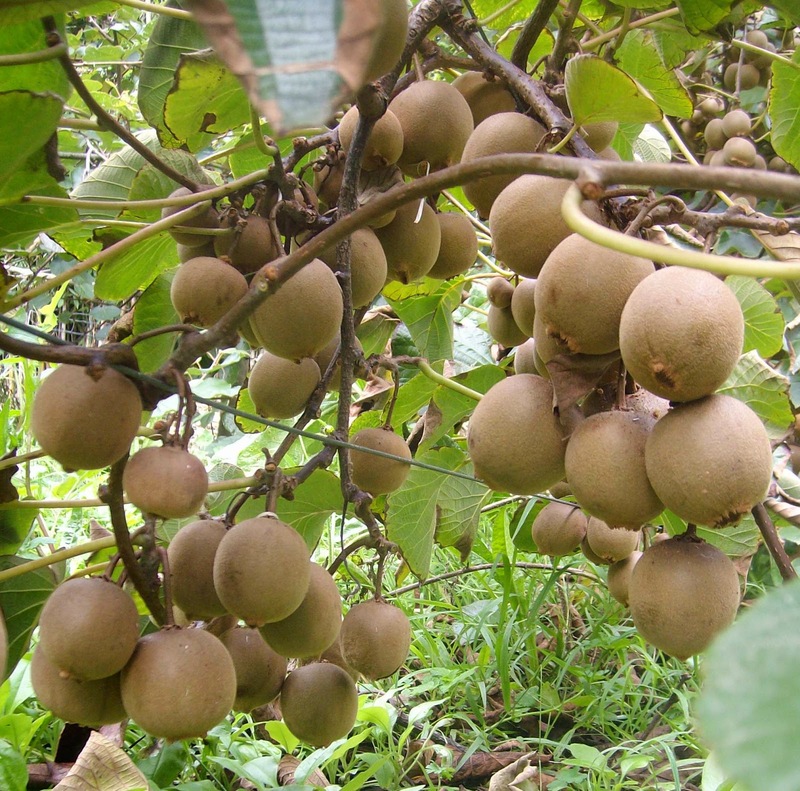 Macadamia nut trees originated in northeastern Australia (not Hawaii) in the rain forests along the coast. Part-time Kiwis Linda (Rich and Linda went to Stephens College together) and Mel (pictured behind Leanne on the bottom right) put us up for a few days and invited all their full-time KIWI friends (Wendy, Leanne and Sylvia) to share a traditional New Zealand meal with us. New Zealand leg of lamb, kumari potato medley, strawberry salad made by Sylvia, and of course the Pavolova dessert created by Leanne. ...and Obi-Wan - in the end I found my KIWI!!! Living on an Island must have an effect on people. Even as big as the north and south islands of New Zealand are, there still must be something that gets into your head. Maybe it's the unifying "Go KIWI" or the All-Blacks Rugby and other sports teams that compete for New Zealand. Perhaps knowing that even though you aren't small, you still retain a small town politeness, courtesy, friendliness and just down right good-natured sense of humanity. Thank you for sharing the beauty of your little corner of the world with us, we will hopefully take a little bit of KIWI with us on our journeys.